The EEG-powered machine harnesses the power of positive thoughts to fill a glass of water. Lifestyle apparel company Life is Good has brought the power of positivity to life in an incredibly engaging way. Whether a glass is half full or half empty depends largely on a person’s perspective: are they looking at it through a positive or negative lens? Life is Good’s new Power of Optimism Machine uses electroencephalography (EEG) technology to literally demonstrate the power of positive thinking right before people’s eyes. By either thinking of things that make them happy, or viewing a screen showing the brand’s uplifting artwork and phrases, users can literally fill a glass with water using only the power of positive thoughts. Joanne Fletcher, senior brand director of Life is Good Canada, says the goal is to inspire people to focus on the good all around them and live with an eye toward positivity. The power of positivity is palpable. Researchers have found that having an optimistic outlook is associated with better psychological and physical health. Optimists typically possess better coping strategies than pessimists, and are more likely to engage in lifestyles that protect against disease and illness. And a 75-year Harvard study found that people in happy relationships tend to live longer. While many people who tried the machine were convinced they would be unable to make it work, everyone was ultimately able to fill the glass with water. There were differences between what constituted positive thoughts for children and adults, however: For adults, positive thoughts tended to be complex or highly specific, such as walking on a beach and feeling sand between their toes, while children tended to focus on simpler things, such as cupcakes or basketball. Life is Good has been dedicated to spreading the power of optimism and helping kids in need since its early days of selling t-shirts on the streets of Boston. The first ever “Life is Good” design served as a simple reminder to focus on the good, and the brand quickly forged meaningful, emotional connections with its community. Committed to building a world where Life is Good for all kids, the brand has since donated over $11.5 million to children's charities. 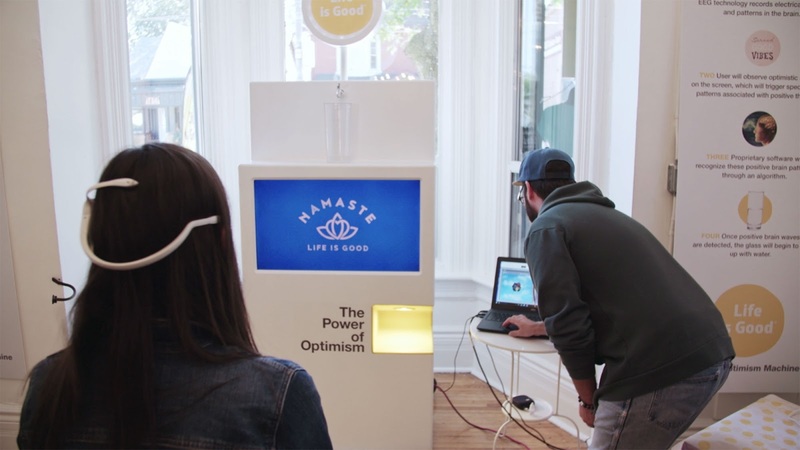 The Power of Optimism machine is currently in Life is Good’s Canadian showroom in Toronto for customers to experience when they come in. The brand intends to bring the machine to retailer events throughout Canada this year so they too can experience the power of optimism for themselves.